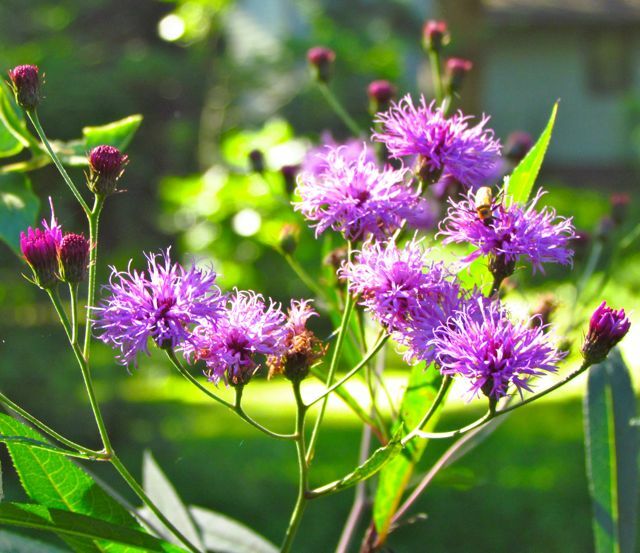 Amethyst-colored Ironweed flowers glow in early morning sunlight. 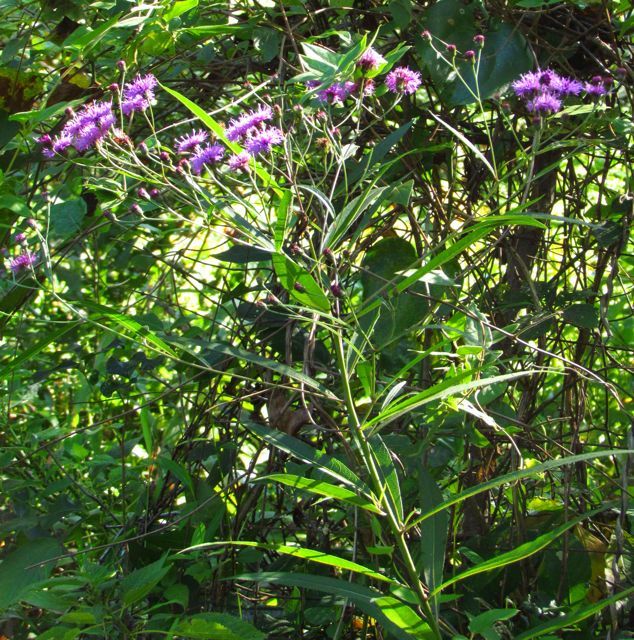 The recent and uncharacteristic (at least for the last few years) August rains in my area have encouraged the local Ironweed (Vernonia noveboracensis) population to new heights of enthusiasm. When we first moved to our patch of NC Piedmont over 20 years ago, I didn’t see any of this common wetland wildflower, so I actually bought a couple of plants to add to the back of a flowerbed, where the height of these late-summer bloomers would not overpower smaller flowers. 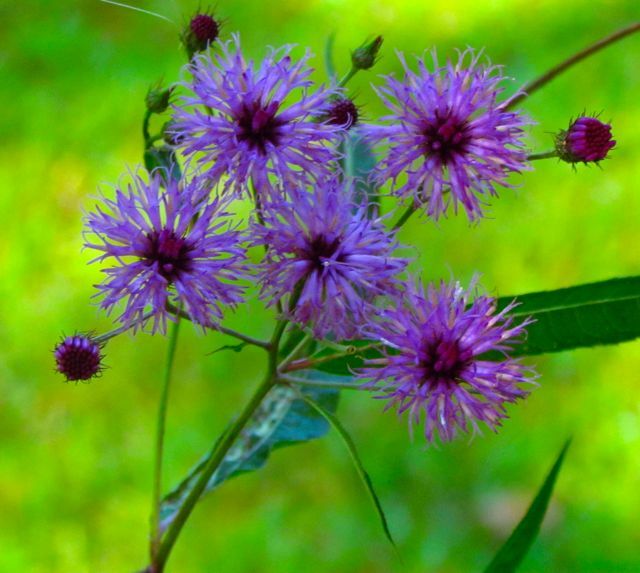 Ironweed is perfectly happy in a typical flowerbed, as long as it receives adequate moisture, but it flourishes best in its native habitat — creek edges and floodplains, where its purple flowers contrast beautifully with the many native composites and goldenrods that can make late summer a monotony of yellow. Of course, after I planted my store-bought plants, I began to spot native volunteers all over the wetter areas of our yard. Clearly, they had been there all along; I had simply overlooked them in the early years. During drought years, I sometimes see no blooming plants, or at best, one. This year — the dampest we’ve had in a while (though not wet at my house) — Ironweed is blossoming randomly all over the moister portions of the yard. I like the way the longish lance-shaped leaves don’t overpower the beauty of the flower head (called a corymb by botanists). When it’s truly happy, it can grow seven feet tall. My wildflower volunteers are more in the 4-5-foot range, which I deem quite respectable, especially given that two-week round of 100+-degree temperatures we endured in July. The flowers are beloved by pollinators, and the seeds, which botanists call nutlets, are favored by a number of native bird species. I leave my plants wherever they pop up and let them complete their life cycles on their own terms. Inevitably, a few seeds escape the birds and sprout into new plants the next spring. You can also propagate this perennial from stem cuttings taken in June or July. Even the native asters that come into their own a bit later in the season are not as deep and rich a purple as the flowers of Ironweed. I highly recommend this trouble-free native perennial wildflower for any spots in your yard that can accommodate its height and moderate moisture requirements. Your reward will be amethyst-colored flowers for over a month, abundant butterflies, and happy local seed-eating birds — a wildflower win-win for everyone. Flower color is even more richly purple when the plant stands in shadows. This entry was posted on August 26, 2012, 10:21 am and is filed under Favorite Plants, Native Wildlife, piedmont gardening. You can follow any responses to this entry through RSS 2.0. You can skip to the end and leave a response. Pinging is currently not allowed.